Welcome to September, the month that's all about owners. Between Owner Days coming up and the annual Meeting of Owners featuring elections for your Board of Directors, it's the prime time to exercise your rights as a co-op owner. Read Gary's full owner loan update here! 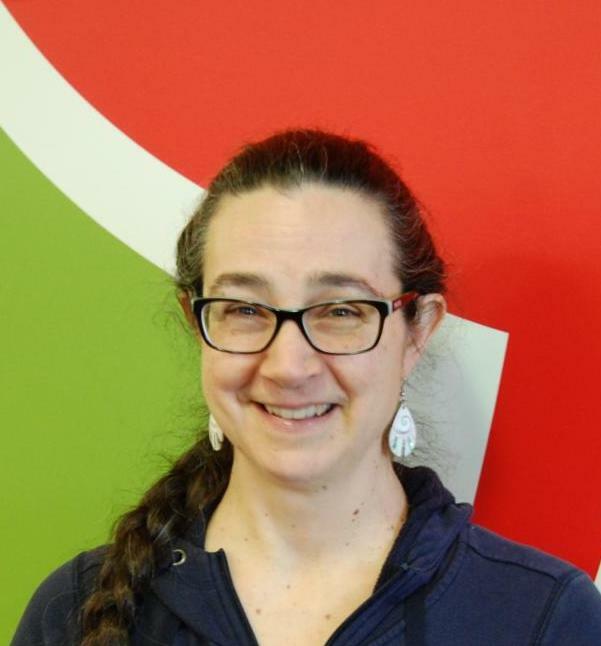 Read the Board's latest update from Marissa Stewart here! 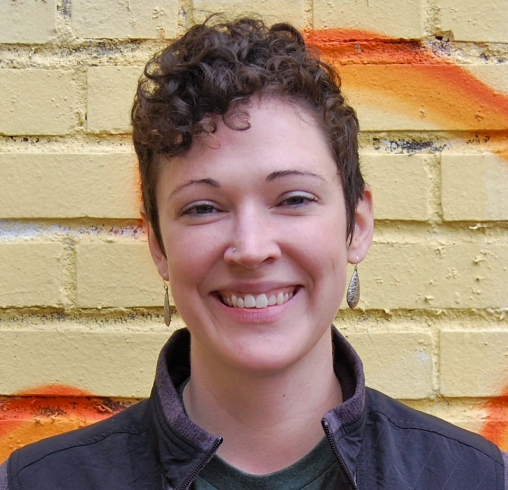 It covers common co-op misconceptions, financial and non-financial benefits of ownership, voting this election season, owner visioning, and spreading co-op love around the community. It's that time again! The annual Meeting of Owners is upon us. 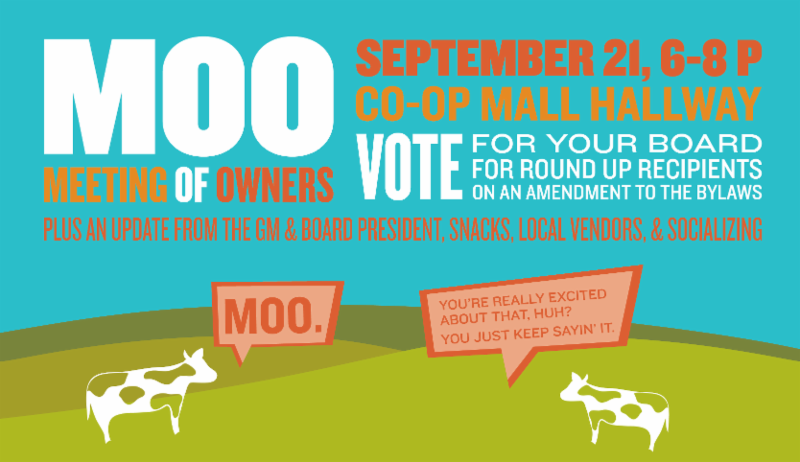 Join us for updates from co-op leadership, socializing with your fellow owners, local flavors from the co-op and our local vendors, and the culmination of this year's voting. Round Up For Good nominations occur in the store by paper ballot from September 1st through September 13th. Voting for nominated RU organizations as well as the Board of Directors occurs via online ballot September 15th through 21st, ending at the MOO. Stay tuned for an email from the Board with more details and voting information. Not an owner? Now's the time to join! 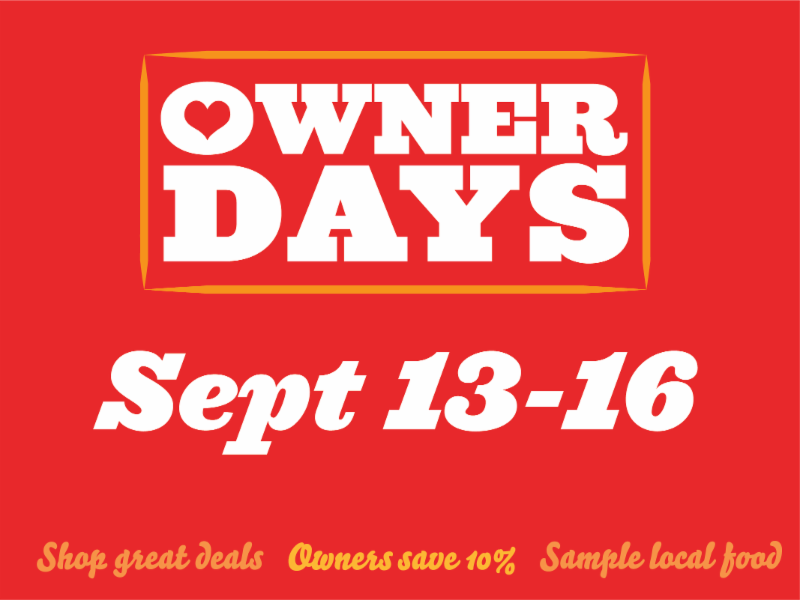 Four times a year, we offer owners 10% off one purchase (excluding sales, Co-op Basics, & alcohol) plus loads of wild deals in the store and there's a handful of local producers in to sample each day. It's a blast! If you haven't been, mark that calendar. To be determined. Whatever it is, it will be locally delicious. Join us for another $5 Chill & Grill night , September 7, 5-7 pm on the porch to celebrate Urbana First Fridays ! This time we're servin' local veggie kabobs ! For $5, you get 2 grilled kabobs, made with locally grown produce from Blue Moon Farm & Sola Gratia Farm, served with (co-op staff-farmed) Green Island Gardens microgreens, and 2 co-op made sides: Classic Potato Salad & Quinoa Tabouli Salad. 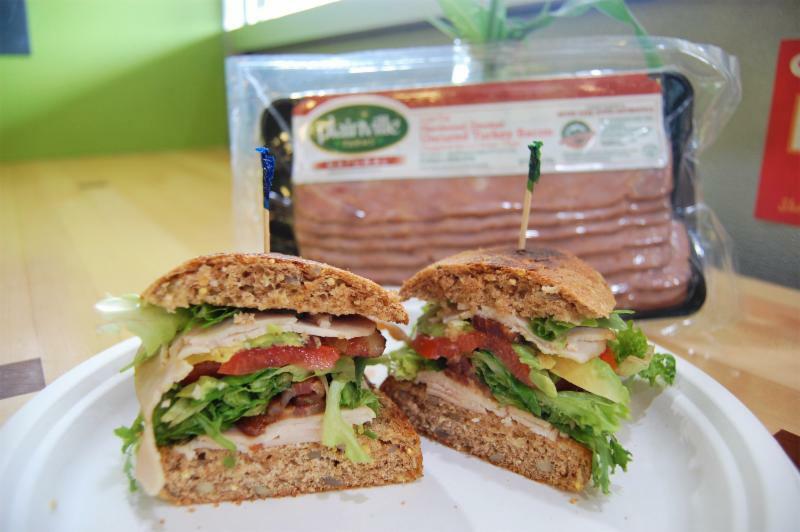 A toasted local Great Harvest Dakota Hoagie filled with oven-roasted turkey, turkey bacon, organic avocado, and, depending on availability, either organic or local tomatoes and salad mix from Blue Moon Farm. Gobble it up! 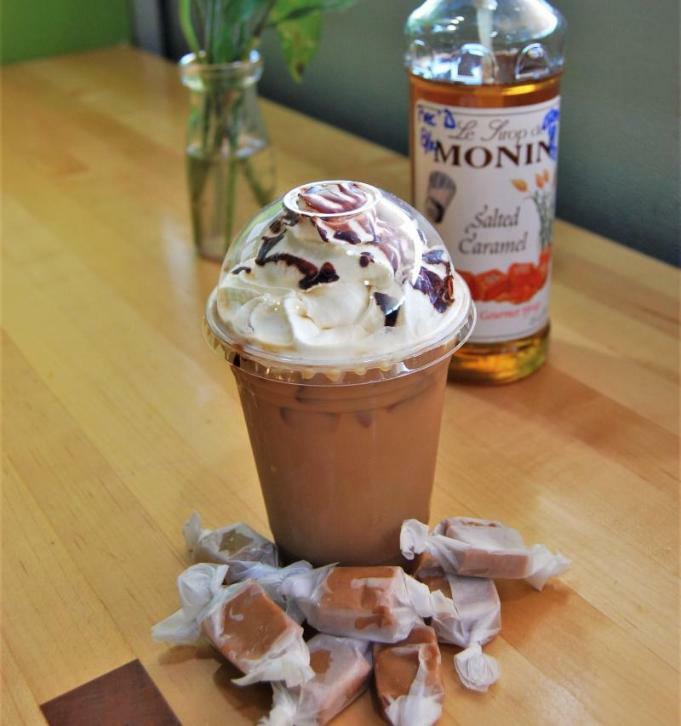 Our delicious latte infused with Monin Salted Caramel syrup and topped with co-op made whipped cream and co-op made chocolate syrup. Beginning 9/4, each day of the week we'll offer a different drink special. See the menu board on the left for your daily reason to stop by the Deli. Treat yourself! 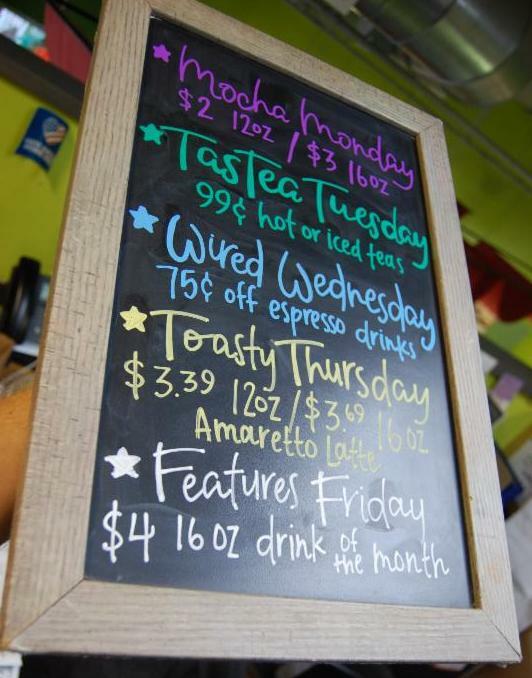 And don't forget to use a coffee punch card, which works for all coffees & teas. We have sandwich punch cards too! Sourcing these from more than a half dozen farms, new and old, we have Gala & Pound Sweet apples, shallots, butterscotch melons, more melons, all kind of peppers, multiple varieties of potatoes, kale, salad mix, radishes, and pears. Rose Water Extract. Finally! You've been asking and we found some from Nielsen-Massey. Find it in the baking aisle alongside their Orange Blossom Water. Bitters & mixers in the juice aisle. An assortment of flavors and brands including Suckerpunch, located in Bridgeview, IL (regional). We haven't offered these ever before, so let us know what you think. Midwest Juicery cold-pressed organic juices made from vegetable seconds from small organic Midwestern farms. Regional & organic. Tuscon (gluten-free) Tamales. Vegan, vegetarian, and meat options. Bubba's Fine Foods paleo, gluten-free, grain-free, coconut flake-based granolas and green banana-based snack mixes. Gopal's Health Foods "ridiculously health and delicious" sprouted pumpkin seeds, rawmesan (parmesan sub), and power wraps (think sushi jerky stick). Sprouted, raw, gluten-free, vegan, organic, high in enzymes, and crave-worthy. 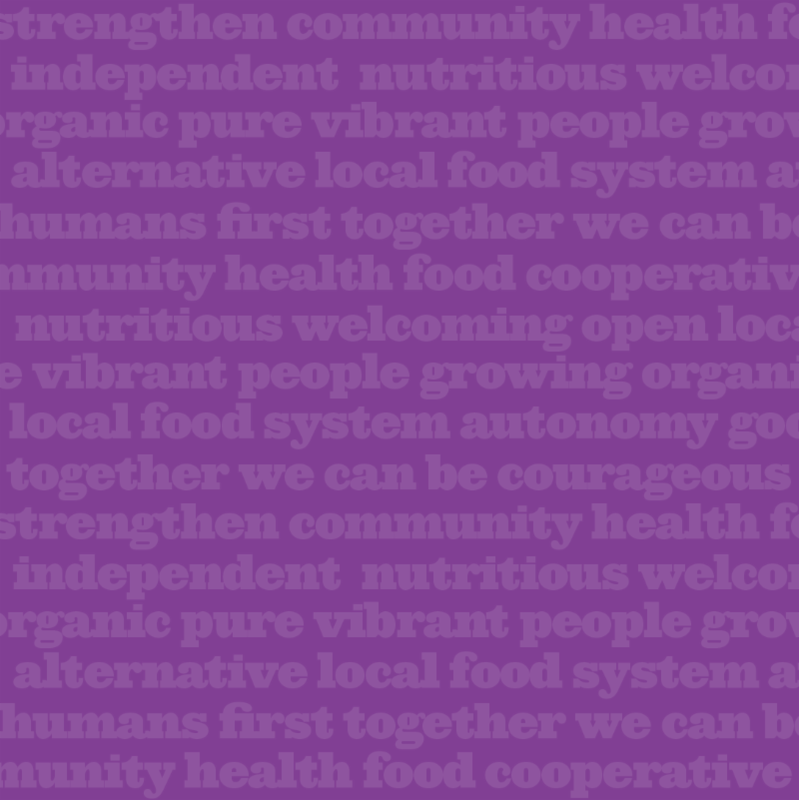 A new service to our community supporting healthy eating, family bonds, and local food. It's Family Meals Month and we want to help families prioritize eating together. Order a $15 family meal kit complete with recipe and ingredients to save you time planning and shopping. See the meal kit details and options in Mia's article here. Regular family meals also increase prosocial behaviors like sharing, and they help to develop math, science, fine motor skills and independence. Read on here for some more benefits of and tips on cooking with your kids. A man who developed terminal lymphoma after being drenched in Roundup as a school groundskeeper has proven to a jury that Monsanto knew of the risks of glyphosate, Roundup's active ingredient, but withheld and continues to deny the evidence. 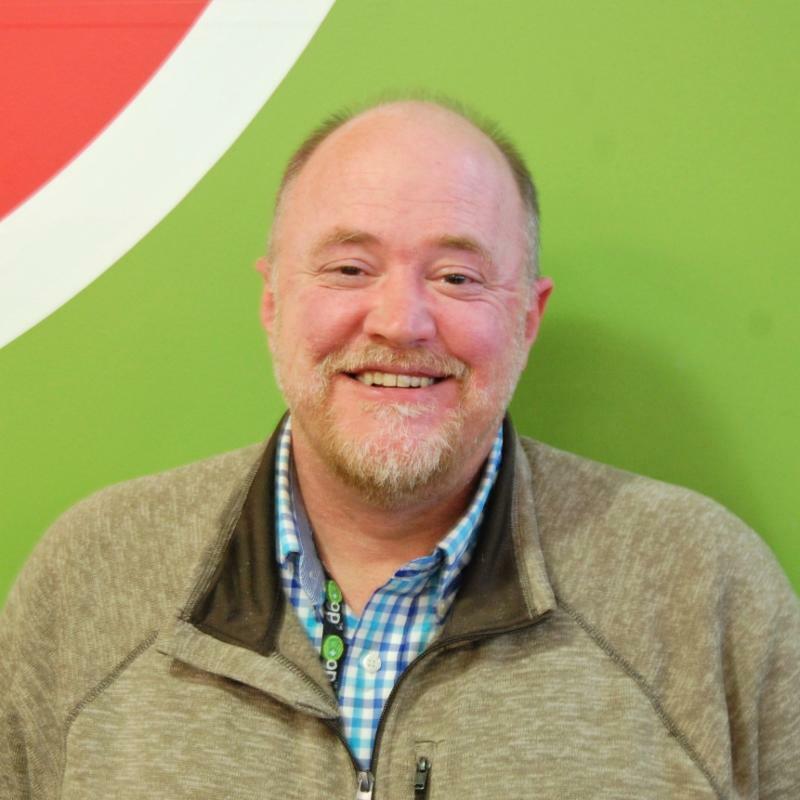 Monsanto's VP says the company will "continue to vigorously defend this product, which has a 40-year history of safe use and continues to be a vital, effective, and safe tool for farmers and others" ( NPR). Good luck, because Bayer's Monsanto now faces 8,000 lawsuits over glyphosate's safety ( RT). The suits have also caused General Mills to remove the "Natural" label from their bars ( Forbes). Big corporations spinning their science is nothing new; the sugar industry has been blaming fat consumption for all of our health problems for years, withholding findings to the contrary and pushing sugar addiction on the public ( The Guardian). The industrial agriculture model was pioneered by these companies. It depends on these products we know are unsafe and it strangles farmers. The co-op remains a great alternative and we couldn't do it without your loyalty. We're proud to support Black Lives Matter C-U, Illinois' only chapter outside Chicago, with our Round Up donations in September. "BLMCU is committed to working vigorously for the freedom, justice, and dignity of Black people, and by extension all people. As we forge our path, we intentionally build and nurture a community that is bonded together through a restorative struggle. 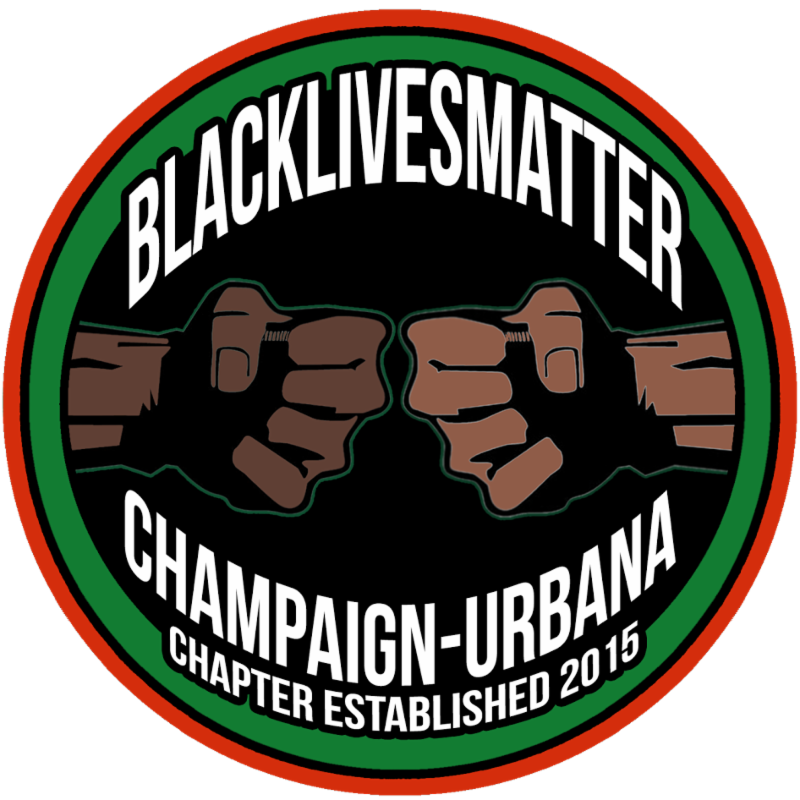 As a chapter of the Black Lives Matter Network, we will engage in collective action against anti-Black racism in Champaign-Urbana." Visit their website for more info on their mission, goals, & work. Just bring in this slip, show it on your device, or mention the word "purple" to your cashier. Valid through end of September. May not be reused or used for sale items, Co-op Basics, or alcohol.